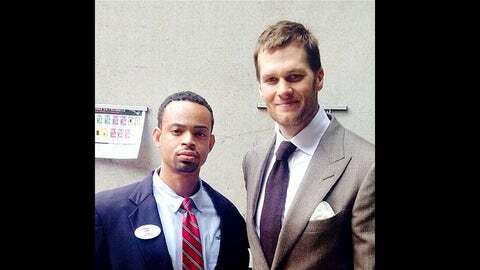 Did Reliant Stadium security guards get fired for taking pictures with Tom Brady? Working security for professional sporting events and concerts certainly has its perks, but a couple of security guards in Houston reportedly learned the hard way that it’s their job to remain behind the velvet rope. Joel Williams and Christopher Moore were both part-time security guards at Reliant Stadium when the New England Patriots came to town on Sunday. As of Monday, the two had been fired by Contemporary Services Corporation for taking photos with quarterback Tom Brady after the Pats’ comeback win, according to KHOU.com. Williams said he took the job very seriously and understood the rules. "When you are at your post and you’re doing your job, you’re not supposed to take pictures with anybody because your job is to secure that area," he said. But once he’d finished his tasks for the day and was about to clock out, Brady happened to walk by. "I said, ‘Hey Tom Brady, good job, good game, man.’ He looked at me and smiled," Williams said. Williams then asked Brady for a photo, and that’s just about when he apparently lost his job. Did Patriots spy vs. Texans? "Immediately after I took the picture, I got ran down by a supervisor," Williams said. "They didn’t really give a reason, they said you know you’re wrong and you’re fired." Moore also says he took a photo with the future Hall of Fame quarterback, and said it’s unfair the two were fired. "What they say and what they practice are two different things," Moore said, "What we see on a daily basis, whether it be Reliant or CSC employees, is them taking picture and asking for autographs from players."